They say ‘big things come in small packages.’ Love letters. Engagement rings. A square piece of plastic that enables shopping sprees and $100 dinners. 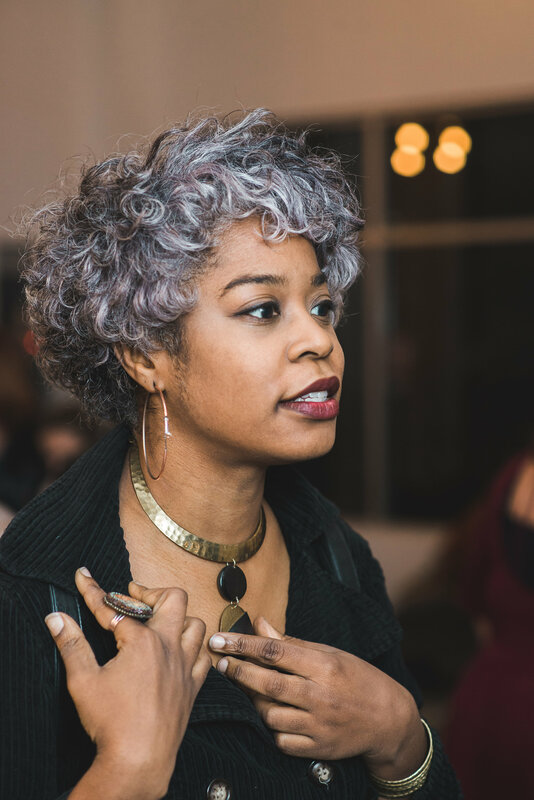 Around the Engaged studio — in the presence of Amber Hatchett’s designs — you’ll discover that small things make big impacts. 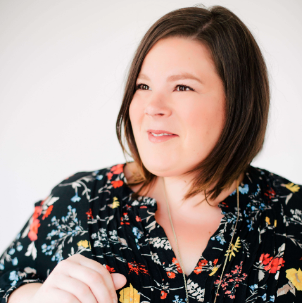 Amber Hatchett, a local jewelry designer and artist (and co-curator of our upcoming Boho Christmas Pop-Up! 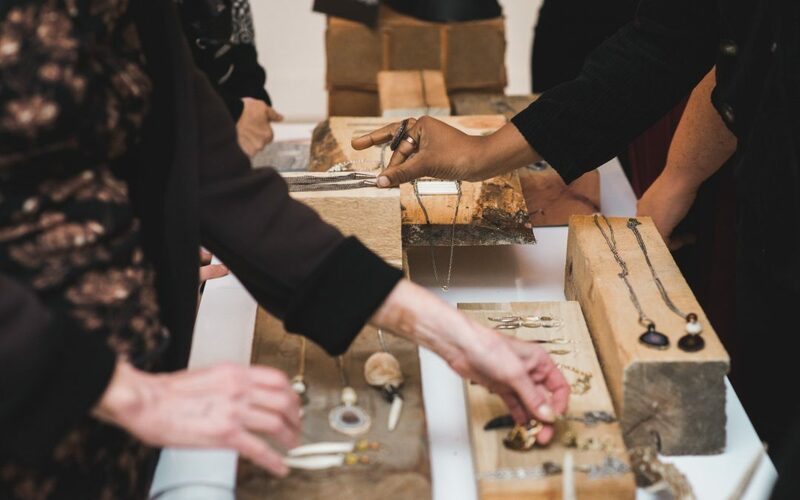 ), forges more than just handcrafted chains when making her statement pieces built from mixed metals and natural materials. By sourcing vintage relics and unique emblems — and even organic elements including bone! 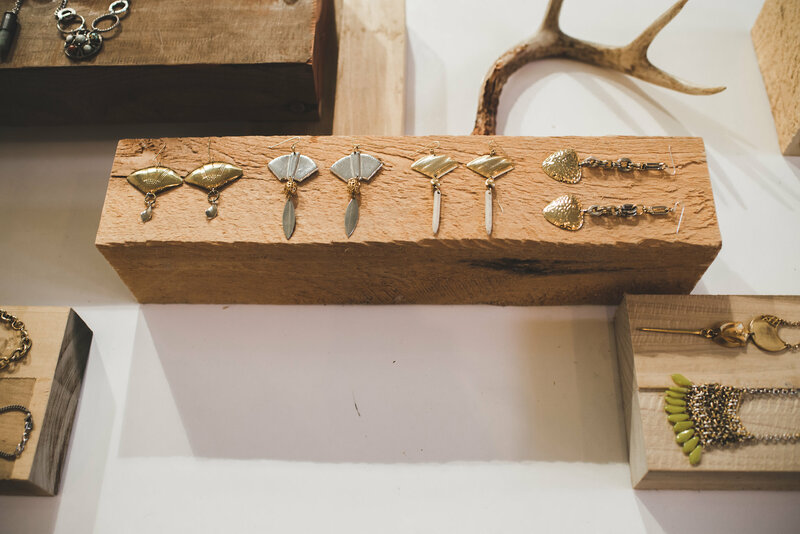 — Amber’s one-of-a-kind designs are layered in both their aesthetic and backstory. 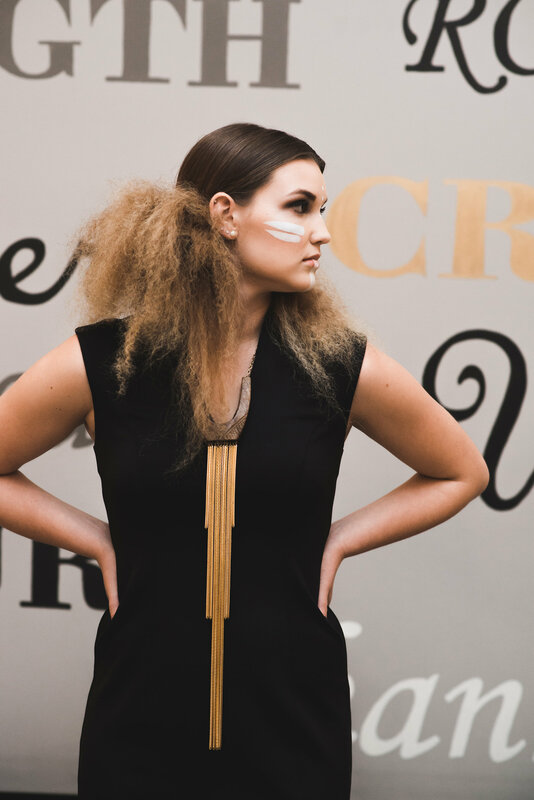 For her latest collection, entitled TRIBE, Amber transformed the Engaged studio into an immersive space that shared not only her newest pieces, but also the inspirations that guided her throughout the course of her design process. 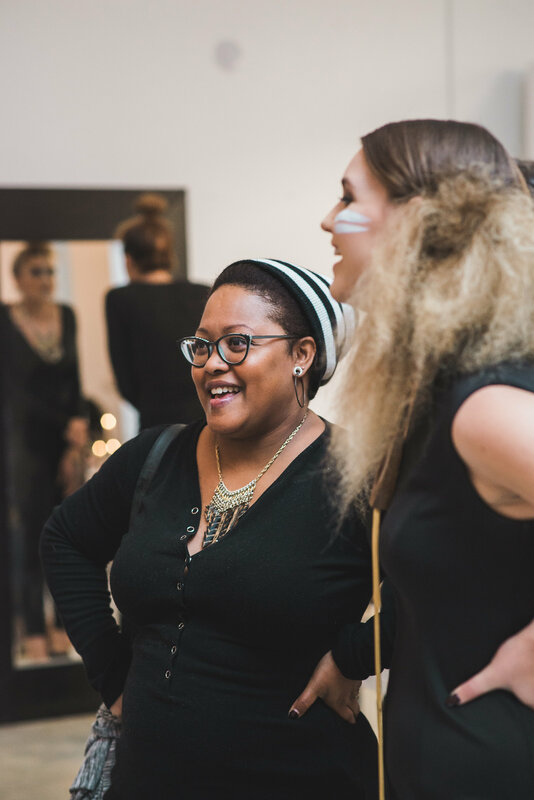 Replete with visual mood boards and models bedecked in Amber’s jewelry, the TRIBE launch party invited guests to dive into Amber’s creative journey and ultimately enjoy the fabulous fruits of her labor. As much as possible, I try to keep up with style trends. But in the long run, I stay true to myself and the style of jewelry design I like. For this collection, that meant elaborating on my signature statement pieces with sharp patterns, elemental shapes, and ornamentations that were low on color but impactful in their texture and structure. The inspirations and materials for Amber’s TRIBE collection immediately call to mind a worldly, tribal aesthetic. 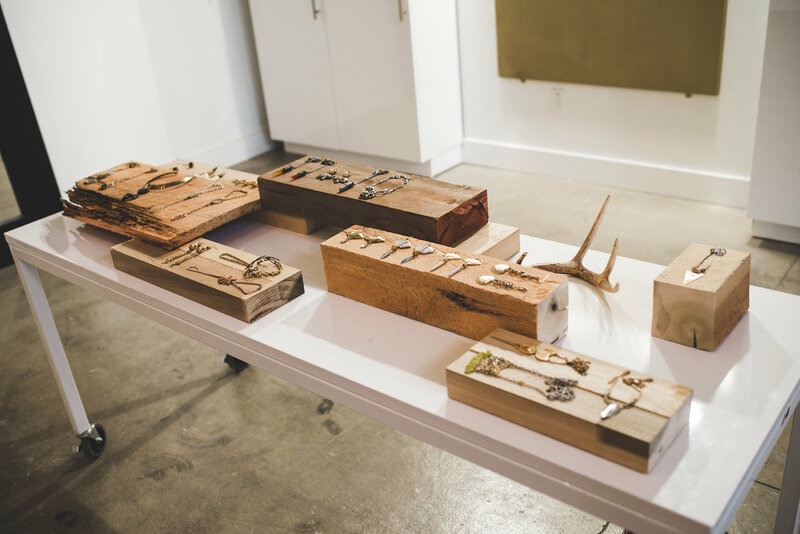 Amber’s rare, often upcycled, materials are always part of what make her designs stand out. 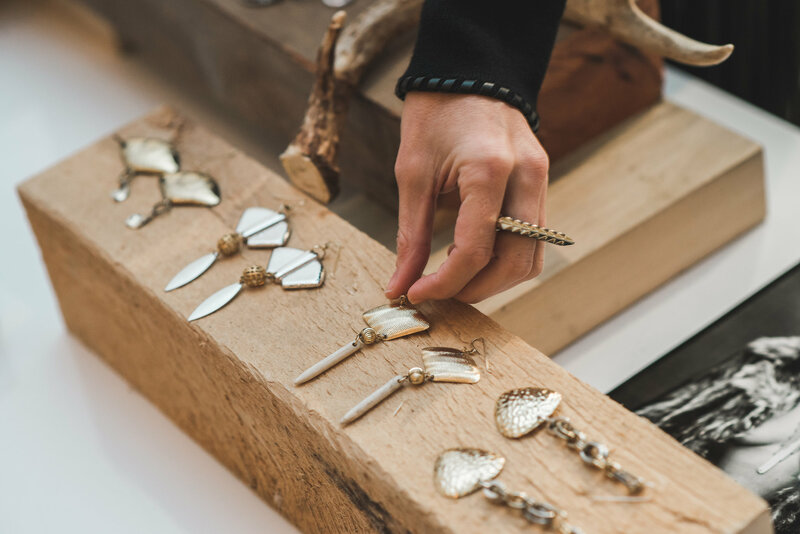 For this collection, she started with her base of patchwork chain links and added hand-carved wood pieces, stamped brass, engraved metal, natural stones, buffalo teeth, and bone. Amber displayed her TRIBE designs on blocks of weathered wood. Choosing wood pieces that appeared touched by the outdoor elements enabled her to add additional natural textures without crowding the space. 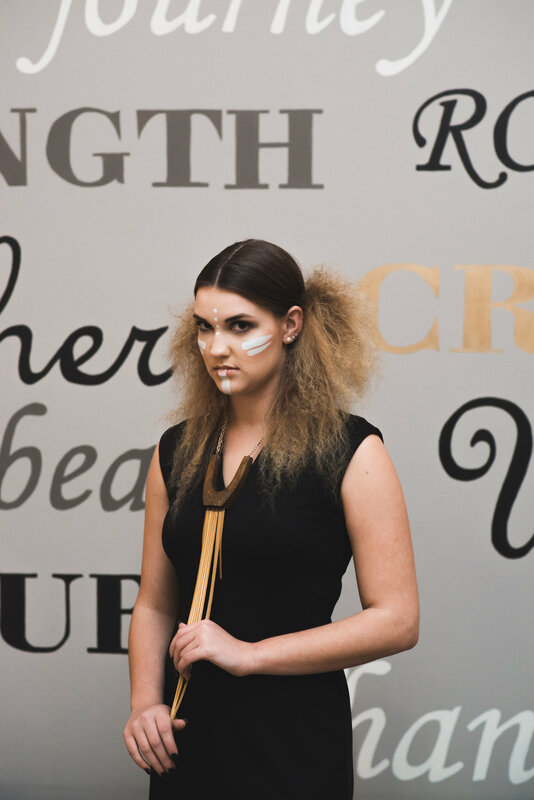 While the Engaged studio was the ideal, “blank canvas” space for Amber to host her collection launch, the typically feminine, bridal furnishings and decor required some tweaking to comply with the her collection’s tribal theme. 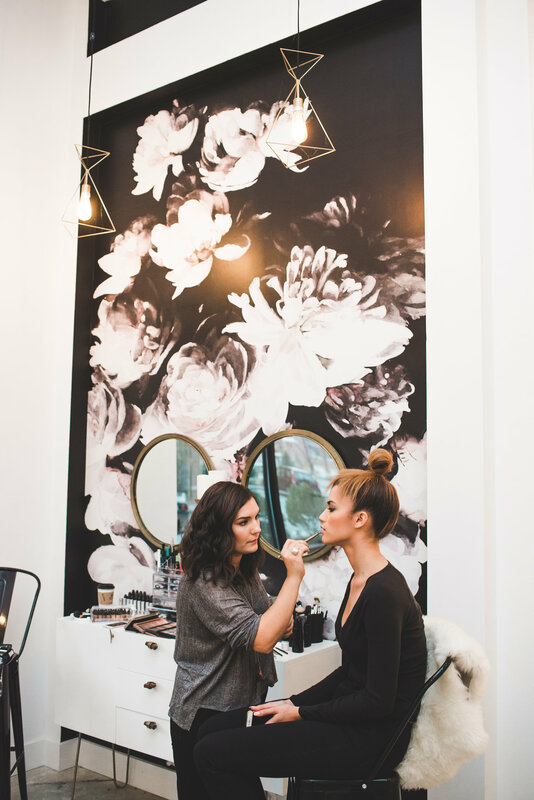 In that vein, Amber staged some seating areas throughout the studio with tribal notions including tribal patterned cushions, fur rugs, woven pieces, and tribal pottery. 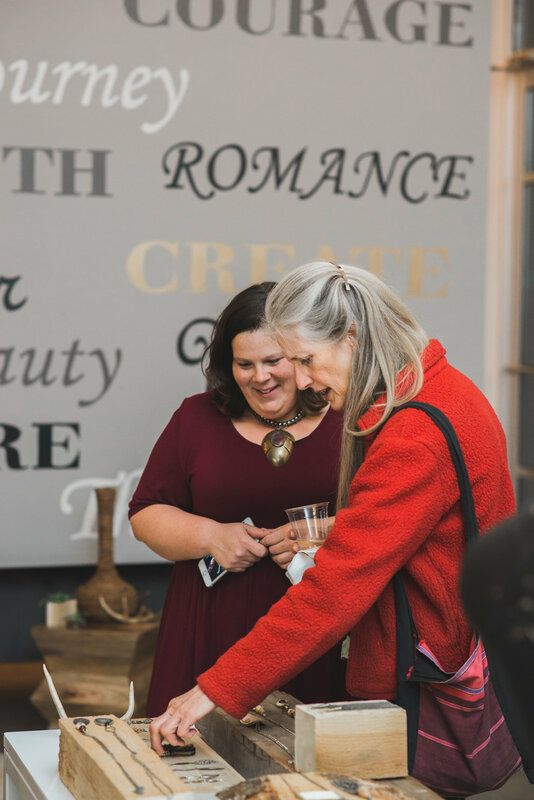 These pieces not only made the space feel more cohesive, but provided comfortable, luxe seating for guests to enjoy on the periphery of the central jewelry display area. 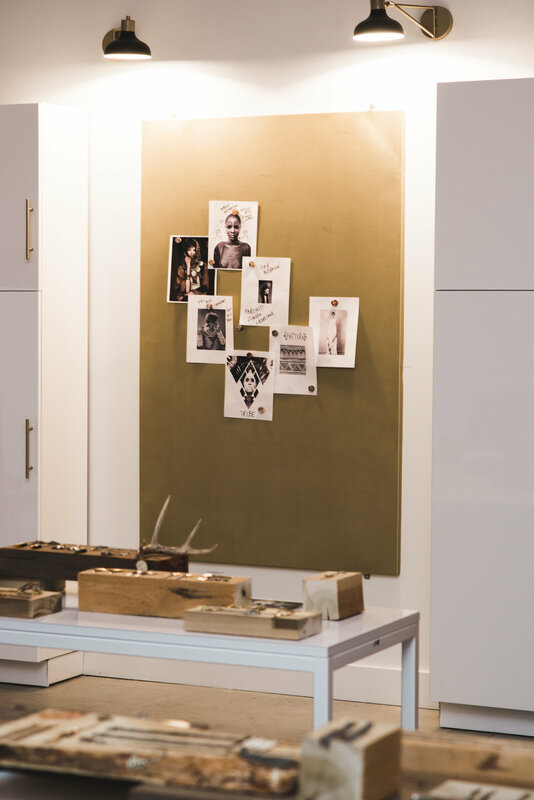 Behind the display tables was a built-in gold magnetic board that served as the perfect space to fill with images of Amber’s inspirations and influences. 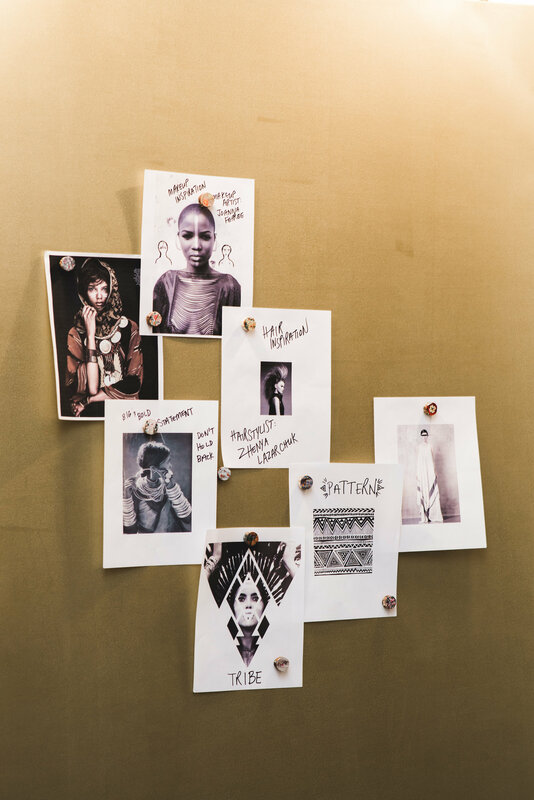 The collage-like visuals showed photos of styles, tones, shapes, makeup, and hair that guided her thought processes during the creation of the TRIBE collection. 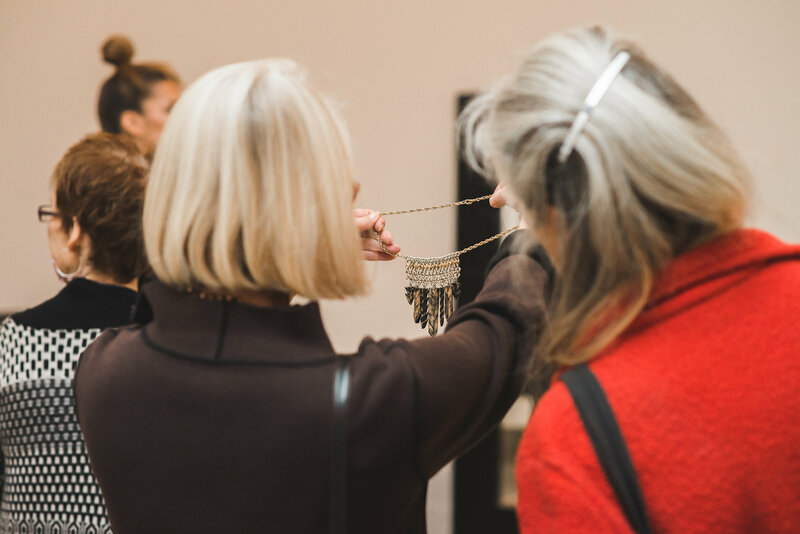 Knowing that jewelry truly comes to life when someone is wearing it, Amber layered several pieces on three models walking around the party for guests to admire on the human figure and to see it styled. 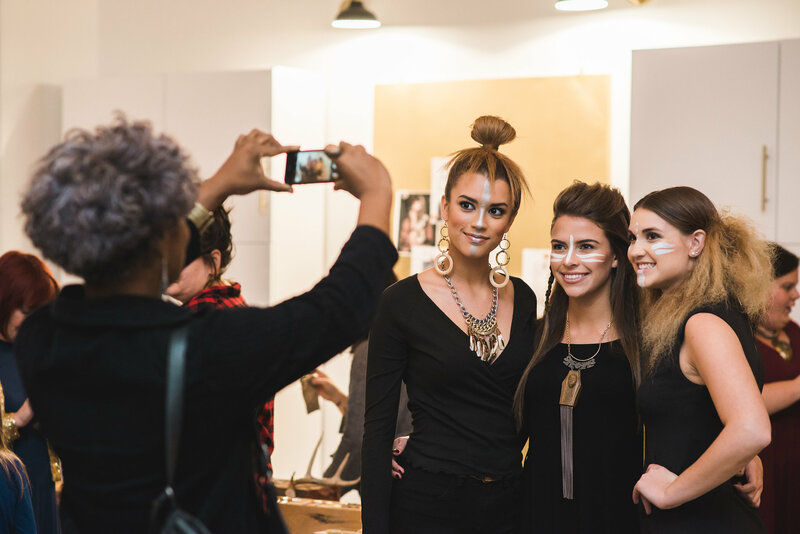 In addition to Amber, the talents of a few local creatives helped her make the TRIBE collection launch party one amazing night to remember! 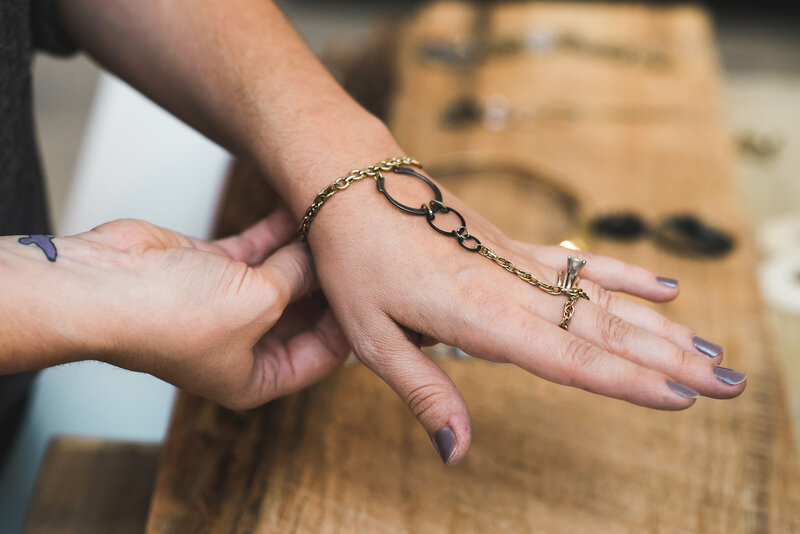 See Amber’s work at the Boho Christmas Pop-Up Shop — starting next weekend! Sad you missed shopping Amber’s designs in person? 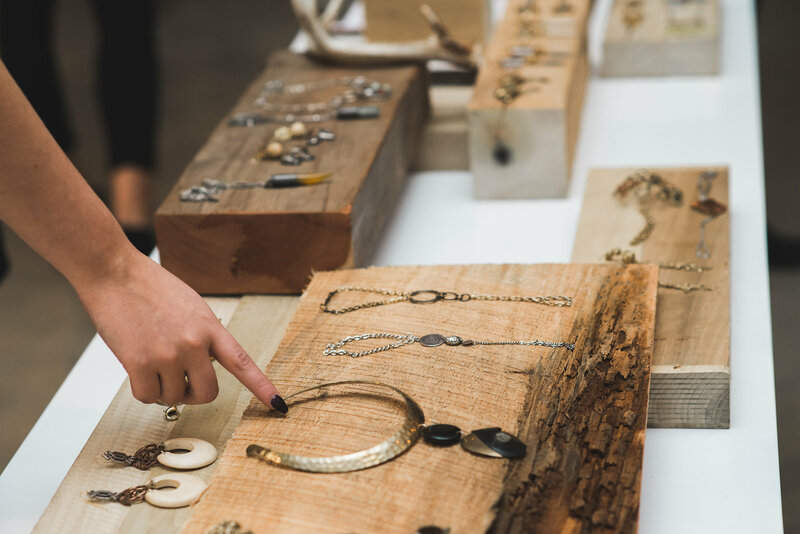 Then you won’t want to miss the 10 Day Boho Christmas Pop-Up Shop happening at Engaged between November 24th and December 3rd. 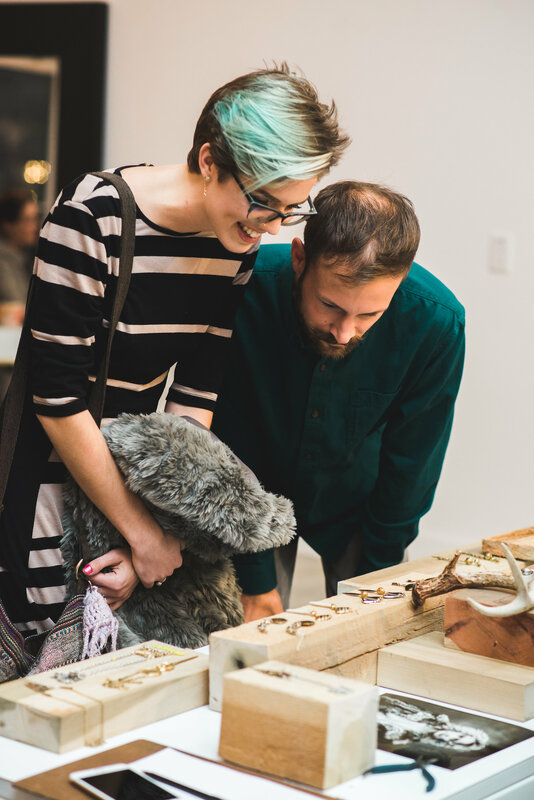 Amber will have her jewelry pieces and other creations on display with the various other vendors sharing their hand-picked and handmade items! All the details are also included on the event’s official Facebook page and linked below! 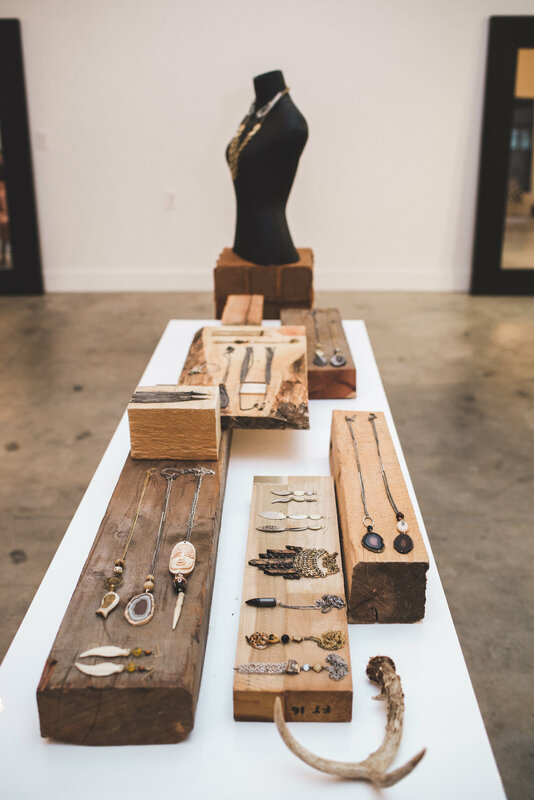 Meticulously forged, all strength and flow, Amber Hatchett’s upcycled statement pieces drip with a rare, old-world majesty — they might have been rescued from the treasure hold of a Spanish galleon, or lifted from Marie Antoinette in her last days. 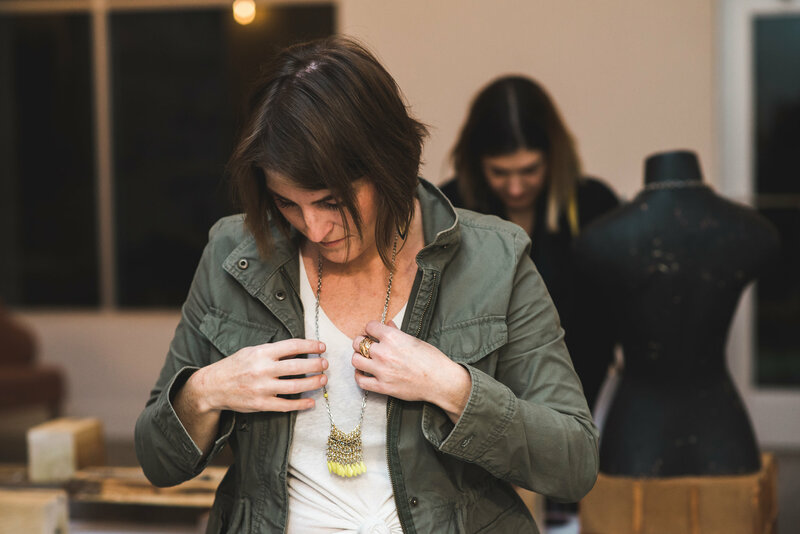 Old coins, spent bullet casings, tarnished military emblems, and rescued crucifixes have all appeared in her work — proud bits of forgotten lives that Amber lifts back to glory. Always going for “more,” Amber has had her out-loud work acknowledged by HATCHfest Fashion, the invitation-only creative summit that dubbed her “Groundbreaker in Jewelry” in 2011. Walking Dead actor Ann Mahoney wore one of Amber’s necklaces on the red carpet. Her pieces have adorned models in the fashion blogs of Trendy Bride magazine, Ruffled, and Borrowed and Blue. 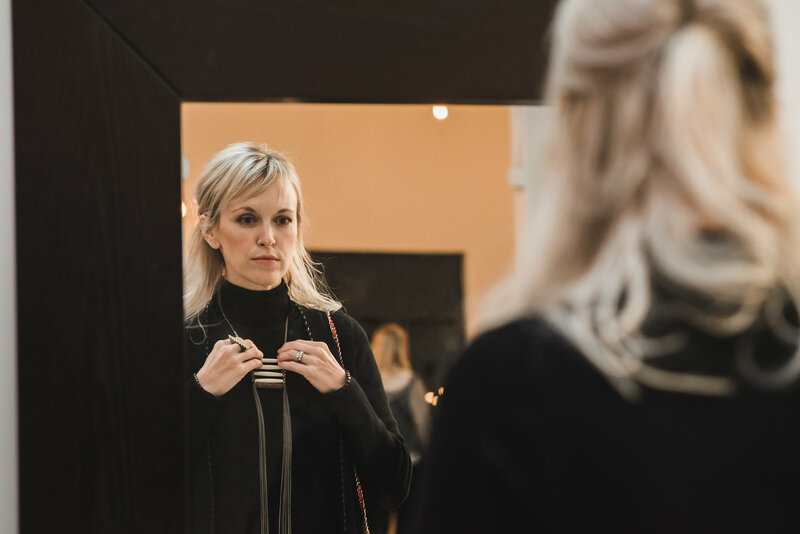 A collaboration with cutting-edge eyewear gallery L’Optique led to a national ad campaign in Invision magazine: Amber’s designs will be seen in every optical shop in the nation. Amber’s vision of the future will always include upcycling the past — but may not be limited to one art medium anymore. 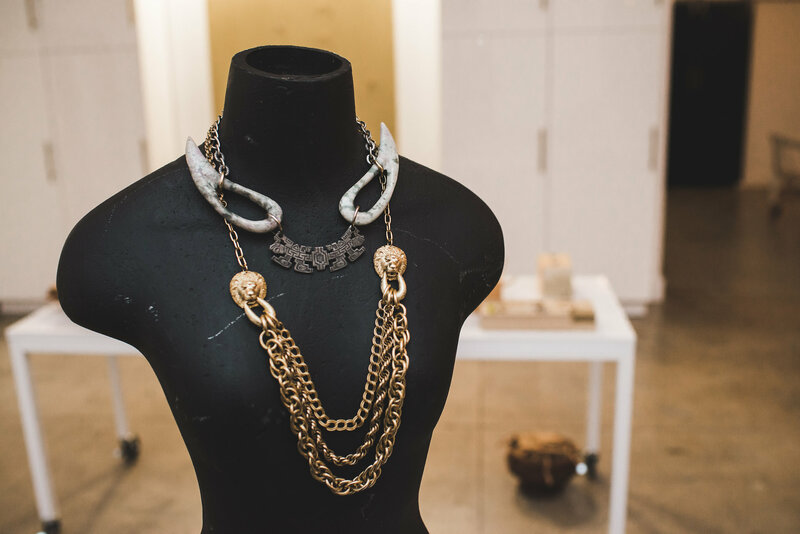 Her talents are layered like her statement necklaces — and that means more is always more. To view more from Amber Hatchett Designs, please visit her Instagram page. You may also refer to her profile on our Creative Team page.